Every other year, Beauty Industry West’s Board of Directors recognizes a special person who has made a unique and enduring contribution to our industry over the course of their career. To be nominated for the Legend Award, candidates must have contributed significant changes that have redefined industry standards or practices, and that have produced a shift in how business is done. Ralph Akuz was voted that honor for 2018. Ralph Akyuz was born in Bodrum, Turkey and earned his his B.A. in Economics and Accounting in Izmir in 1954. He earned his B.S. in Chemistry and Textile Sciences at the Philadelphia Textile Institute (later known as the Philadelphia College of Textiles & Science) in 1960. Upon graduation, he began his career as a chemist at Sandoz and later Allied Chemical. In 1965, he began a career at Clairol, Inc., as Group Leader for Hair Color Research. At Clairol, Ralph developed base formulas for existing and future hair color products. He then joined Revlon Research as a Hair Color Research Scientist in 1967. Almost five years later, Avon Products recruited Ralph as a Senior Development Chemist. Beginning in 1978, he worked with Jheri Redding to create Jhirmack's best-selling hair care products. He was hired first as Assistant Director of R & D and soon was promoted to Vice President of R & D.
In 1982, Ralph moved to Southern California and formed Raffaello Research Laboratories, Inc. Here, he developed countless best-selling, high-end skin care and hair care products. He designed his own R & D, Microbiology, and Q.C. Labs; developed a Material Management System, including a program for assuring compliance with FDA Regulations; directed the creation of all new product concepts; and provided valuable input to marketing and sales promotional campaigns. Additionally, he advised client Education Departments in client-specific technical material presentation. Ralph was pleased to know he would be receiving the Legend Award, but he passed away, unexpectedly, earlier this April before formally receiving it. 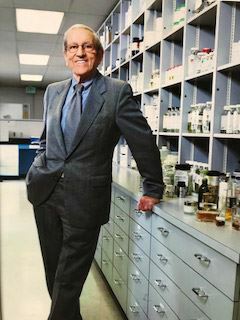 Several of his colleagues, including both clients and chemists he mentored, will share stories of his unique career and his valuable contributions. His daughter Rebecca will also speak about her father and will accept the award on his behalf. Appetizer: Sweet Briar Salad of mixed Baby Greens with sun-dried Cherries, Pistachios and Fresh Raspberries topped with Gorgonzola Cheese, served with a choice of dressing. With deepest gratitude, respect, and affection for Ralph Akyuz - our dear friend, mentor, and enduring inspiration.